Honorable Chief Election Commissioner Dr. Ayodhee Prasad Yadav Submitting the annual report of Fiscal Year 2074/75 to the Right Honorable President Bidhya Devi Bhandari. Honorable Chief Election Commissioner Dr. Ayodhee Prasad Yadav Submitting the annual report of Fiscal Year 2073/74 to the Right Honorable President Bidhya Devi Bhandari. 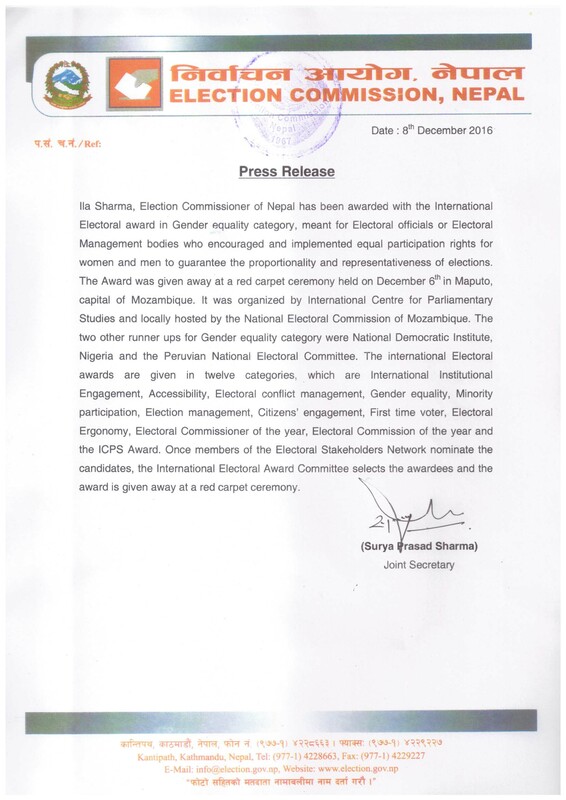 Honorable Chief Election Commissioner Dr. Ayodhee Prasad Yadav handing the winner certificate of President Election, 2017 to the Right Honorable President Bidhya Devi Bhandari. Honorable Chief Election Commissioner Dr. Ayodhee Prasad Yadav submitting the result of National Assembly Election, 2074 to the Right Honorable President Bidhya Devi Bhandari. Election and Media MTOT program organized at ECN for central and state level elections on 4th October, 2017. Staffs of Election Commission, Nepal, cleaning the office premises on the occasion of Civil Service Day, 2074. Hon. Election Commissioner Ishwori Prasad Paudyal addresses participants at the training on Election and Media,March 7, 2017. The speech of Election Commissioner Sudhir Kumar Shah delivered in a press conference held at the Media Center of the Election Commission on November 02, 2017. 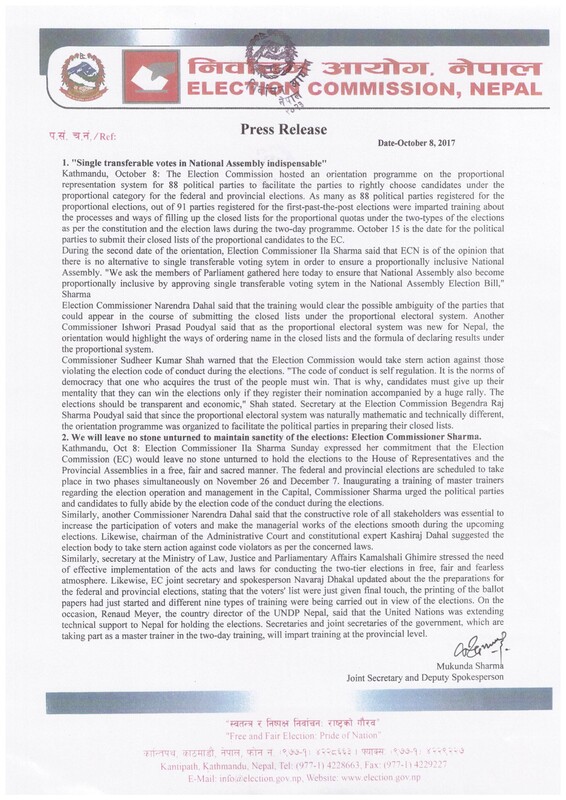 The Election Commission, Nepal (ECN) has modified the election calendar for the second phase election, based on Nepal government's decision to reschedule election inprovince 2 on September 18, 2017.